On September 28-29, we will be hosting the most fun youth event the OBX has ever seen. Children ages 10-15 years old are welcome to attend. Activities to enjoy throughout the night include dodgeball, jousting tournaments, foam cube and ninja races; all with prices. There will be a Fortnite room setup up with other games and consoles available as well. We will also have movies playing on the big screen! Pizza and bottle water will be served by Jumpmasters. In addition, our full concessions stands will be open all night for jumpers to purchase. Our Dippin' Dots are always a hit! Doors will open at 7:00 AM Sunday, September 16th. Jumpers will need to be picked up by 7:30 AM. We recommend aiming for a 7:00 AM pick up time just in case. 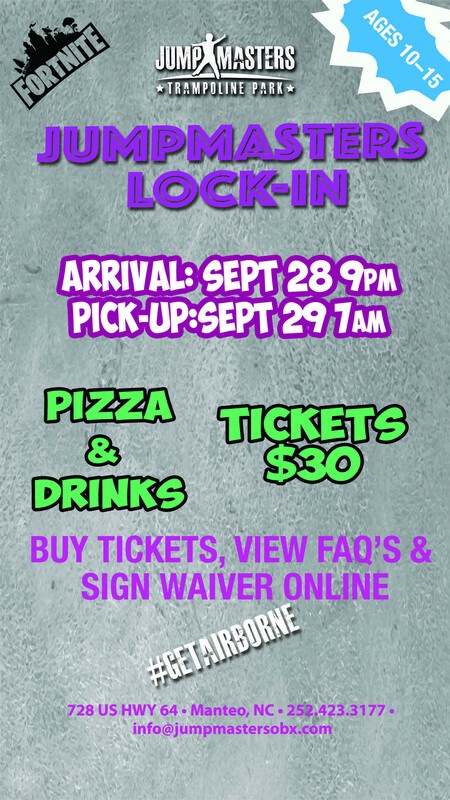 View more Lock-In Details and Sign up.